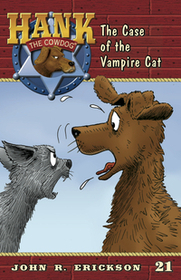 Hank encounters the weirdest cat he’s ever seen, when he, Slim, Drover, and Little Alfred head over to the Hodge’s place to feed the cattle. Hank gets bumped out of the back of the Cammo-Stealth army truck, Mary D. Cat is the only one around to help keep Rip and Snort at bay. Will Slim realize Hank is missing in action? Is Mary D. Cat really a vampire? Or could it be--gulp--that she’s a good cat after all?